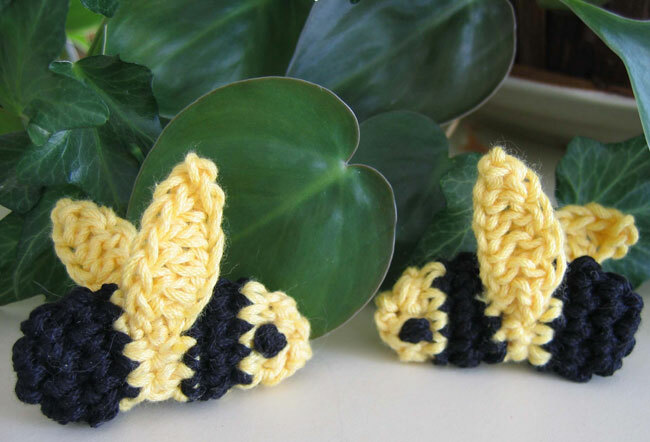 Cute and friendly bumblebees to adorn your summer-fun accessories! 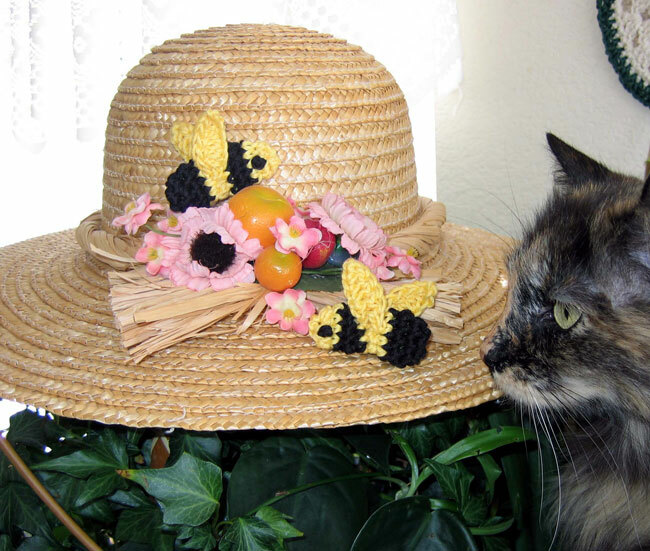 Add to hats, purses, totes, wreaths … whatever strikes your fancy. 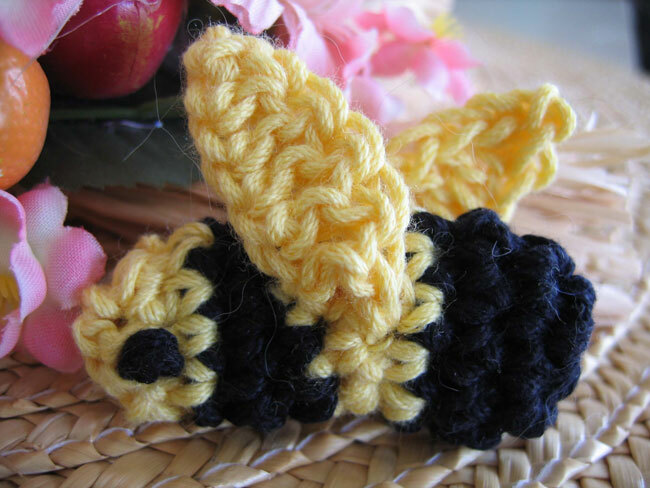 Bumblebee is worked in joined rounds from “tail” end to “nose.” Do not turn at end of each round but continue in same direction to form tube-shaped body piece. As you work, push yarn tails to inside for stuffing. Wrap yarn around finger once, insert hk into lp on finger, yo, pull lp through, follow patt as directed, working over strands of ring. After first few rows are completed, pull tail to close ring. Ch 1, sc in ea sc around, join with sl st, pulling yellow through as you work sl st (drop black but do not cut it). Round 5 Ch 1, sc in ea sc around, join with sl st, pulling black through as you work sl st (drop yellow but do not cut it). Round 7 Ch 1, sc in ea sc around, join with sl st, pulling yellow through as you work sl st.Cut black and fasten off, stuffing tail to inside. Round 9 (dec rnd) Ch 1, sc in same sc, *sc2tog, rep from * around, join with sl st (5 sc). Fasten off yellow, leaving 12” tail for sewing. Gather top lps of ea rem sc around and cinch to close. Bury tail inside piece. Fold piece so it is flattened a bit, positioning joining point of rnds at bottom part of fold. With black, embroider two French knots on either side of “face” near “nose” end. Insert hk between sts of first black stripe and first yellow stripe, about 2 sts down from top. Draw yellow through, leaving 6” tail for sewing.Ch 6, sc in 2nd ch from hk, hdc in next ch, dc in next 3 ch; join with sl st to other side of same yellow stripe by inserting hk between sts of this stripe and next black stripe. Fasten off, leaving 6” tail for sewing. Rep on other side of piece for second wing. Secure wings by weaving tails through sts on body and through to inside of piece. Wings can be folded up (as shown in photos) or down as desired.